Importance of a Clean Workplace- Bortek Industries, Inc. Most importantly, when you bundle all of these factors together, a clean work environment can have a major impact on the financial value of the company. We will explain! A messy environment is a dangerous environment. When an employee operates in a disorganized and dirty environment, there is an increased risk of accidents. According to OSHA (Occupational Safety and Health Administration), an occupational hazard is anything in the workplace that may cause harm. These hazards are often neglected by the employer. Preventative action, personal protective equipment, and other safety measures are critical for employers to provide a safe and hazard free environment for employees. Plus, a safe work environment reduces the number of workers’ compensation claims. 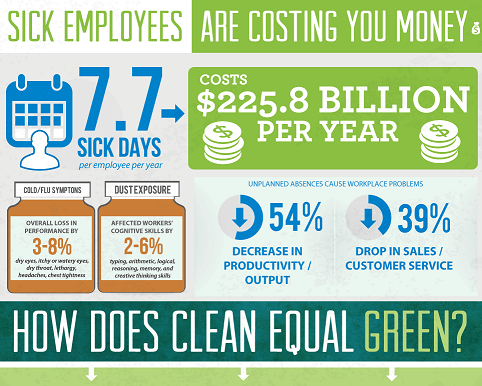 On average, employees take 7.7 sick days per year. The lost productivity and effect on the rest of the company for these unplanned days is extremely costly. At the same time, other employees may still be sick but attempting to work at less than full strength. The decreased efficiency may cause deadlines to be missed or other avoidable errors to occur. How can we take preventative measures to reduce the number of employees under the weather? Simple, by keeping the workplace clean! The first thing we need to think about is the number of workplace surfaces that can be regularly contaminated without proper cleaning. Door handles, break room appliances (refrigerators, microwaves), water fountains, bathroom faucets and toilets, desk phones, and desktops are all examples of surfaces with high levels of contamination. Regular cleaning can bring a 62% reduction of virus contaminated surfaces. To employees, their workplace is like a second home. They spend a significant part of their lives in the office, facility, or warehouse. Therefore, the workplace should be cared for in a similar way as your home. A work environment that is well maintained and which allows employees to be productive, will ultimately lead to happier, more satisfied employees. Employees are a direct representation of your business. They can act as a marketing source (good or bad) for employers through communication with friends and family. A dissatisfied employee is less likely to promote the company with any positive remarks. Keeping employee satisfaction levels high often has a direct effect on the company brand or image, as well as increased productivity. First impressions matter. As a potential customer enters your parking lot or walks into the store, a clean and welcoming environment is important. It gives the customer a feeling of trust and confidence with the company. A professional looking business tells the customer you should be taken seriously. For example, consider entering two businesses offering the same product. One company is messy, dirty, and disorganized, while the other company presents a clean and professional work space for the customer. Which company are you more likely to purchase from? When thinking from the perspective of the customer, a clean workplace implies superior, quality products and services. A clean facility shows that you care about your employees and that you take your business seriously. The graphic below demonstrates that the greatest factor for customer satisfaction was determined to be cleanliness, ahead of value, speed, convenience, and variety. The statistics also show that 94% of customers would avoid a business in the future if they encountered dirty restrooms. Cleanliness is a good representation of the brand.